Studying the culture and folklore of Turks, we can not limit ourselves to the borders of today's Turkey. Turks have a proud cultural history that started out in the steppes of central Asia, and at the height of the Ottoman Empire, spread all the way to The Balkans; not to mention the Asia Minor" and most of Arabia. All of these regions can be divided into eight dance categories: HORA, ZEYBEK, KASIK, TEKE, HALAY, HORON, BAR and AZERI. Since it is rather impossible in a short article such as this to articulate on all the songs, sayings, dances, costumes and musical instruments of all these regions, I will give the reader a glimpse into some of these categories. " HORA; Edirne, Kirklareli, Tekirdag province and Uskup. Out of the four regions listed under HORA, Uskup is the one which is most intriging due to the fact that it does no longer lies within the borders of Turkey. Known to the Westerners as Skopia, Uskup is a city of 650,000 in Yugoslavia, majority of residents of which are Turks. Uskup, with. its culture havily influenced by, theTurks since 1389, with all of its music, dances, costumes and local customes display an all-Turkish city in the heart of the Balkans. 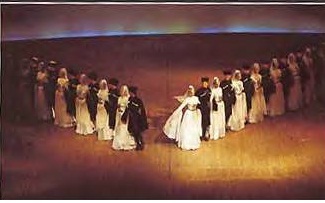 Dances of Uskup can be performed as line or couple dances. The basic costum­ing for the men is: A white, .long_sleeve, button-down shirt worn under ,a navy blue vest covered with lace and embroidery of black gilt thread. For pants, they wear either navy blue or black rather tigh-gitting “potur”. Besides the white socks and open-front black shoes, the costume is completed with a white sash and a watch chain. 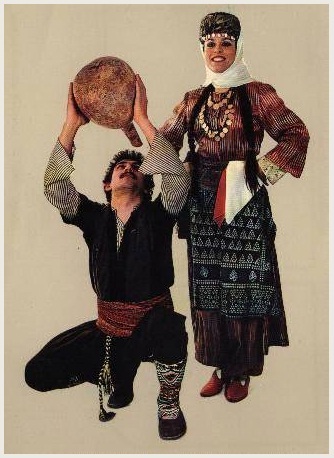 Womens' costume consists o a long-sleeve, white shirt a vest shaped like the mens’ but always in brighter colors, a baggy pair of pants (shalvar), and a red pair of shoes. Accessories of women. are a necklace with a"variety of gold coins attached and ahead scarf, called “yazma”­. Zeybeks are Brave mountaineers who live in western Turkey area such as lzmir etc. This type of western folkdance has 9/8 tempo counted in music:3/4 plus 3/8. The main instruments of this type of dance are. : darbuka (hour-glass-shaped drum), clarinet, kanun ( a flat string instrument, finger-picked on one's lap), and rills. This type of dance is a slow motion dance, portraying the man as a brave, heroic and freemountain eagle. The Zeybek dancer is instantly recognized by the odd-looking costume he wears, which consists of short, loose trousers leaving the knees bare, heavy boots with spat-like attachments, ,and colorful flannel shirts that have. bat-like sleeves, signifying the eagle. In western Turkey, this dance is still very popular and is important part of the cultural and social life of the people. The difficult part of this dance is taught and handed down from generation to genera­tion. TEKE: Burdur, Isparta, Antalya, Muğla, Fethiye provices. 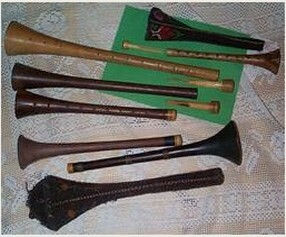 Widely used in this area are sipsi, vulum (bagpipe) and Kabak kemane. Sipsi: This, in some other regions is called "coban dudugu" (a shephard's whistle). Its length is approximately is six to eight inches, and is made from bam­boo of quarter-inch diameter. Tulum: This Turkish bagpipe is ba­sically a half of a goat skin. The remain­der of the goat skin, consists of one-half of the body and the two legs. Certain other regions of Turkey recog­nizes tulum as culum zurna, gayda, Kay­da. Gayda and Kayda, both of which meaning the same depending on the Turkish, dialect, is derived from the word “kaide;” meaning the rule-in music; the tuning or the tune. KASIK: Bursa, Bilecik, Eskisehir, Bolu, Kastamonu, Kirsehir, Konya, Silifke provices. Kasik means "spoon" in Turkey is a widely used rhythm and dance instrument in Turkey and are an integral part of the styling of this region. Men and women click the rhythm of the dance with .a pair of wooden spoons in each hand. This type of dance symbolizes the every-day. life of the peo­ple of Anatolia and is danced to the accompaniment of clarinet and davul, a very large double-headed drum, although in other regions played with sticks, played in this region with the snappy movements of fingers. 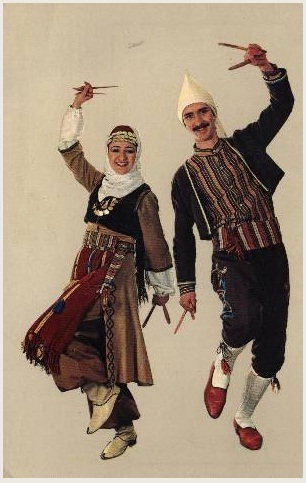 Some of the most well known dances from this region are named: "Silifke’nin Yogurdu" and "keklik:" "Yogurt of Silifke" and "Partridge," respectively. In "Silifke'nin Yogurdu", the dancers immitate the acts involved in yogurt making, and in "Keklik", they skip and hop with the footwork and .sway arms wildly on sides, come to a sudden stop and seeds and then suddenly start flying again. HALAY: Corum, Yozgat, Amasya, Tokat, Sivas, Malatya, Gumushane Ela­zig, Bingol, Adana, Gazi Antep, Sanli Urfa, Adiyaman, Diyarbakir, Mardin, Siirt, Bitlis, Mus, Erzincan, Kars (partial), Van, Tunceli, Bayburt provices. Village Socks: This is, one of the most common hand crafts of Anatolia. They are made in all corners of the land and each region can be recognized by the special motives attributed only to them. As a matter of fact these elaborate socks are named according to the type of pattern of the motive on them. They are made out of wool for the winter and of cotton for the summer. Yazma: This is the head scarf used by all women in all the rural areas. Just like the socks, they are an ancient art from of the Turks. What distinguishes one yazma from the other is not really the material, but rather the “oya” sewn around the edges. Long winter nights are the times for many hours of careful knitting of “oya”. “oya” is such a significant hand-art form that many scientific books have been written on them, mostly in an attempt to preserve this art form. Kese: These are little bags, usually tied down from one's sash, used for variety of purposes. They can be made out of leather or cloth. They were mostly used to carry money, tobacco or men's watches. Guvercin Oyunu: This Elazig dance is one of the animal imitation dances. The, name translates as the Dance of the Pigeon. Pigeons, as well as in many other parts of eastern Turkey, are in Elazığ too are known as holy animals. This is due to the commonly known story that when Prophet Mohammed was running away from his enemies, with a few of his men, had hidden in a cave (Hira). A spider instantly formed a web and then a pigeon laid an egg just in 'front of the cave, leading the searchers to think that' no 'One could have recently been in the cave and Mohammed's life was Saved. Not only in Elazig, but in many other areas of Turkey it is possible to see dances by the same name. HORON: Ordu, Ciresun, Rize, Artvin, Trabzon provices. The two main regions under this category are Artvin and Trabzon. Both regions dances are characterized with the sharp footwork that the dancers-both men and women-display imitating the turbulent waters of Black Sea to which they live next. With the slow footwork, shimmies, and sometimes arms being raised with straight elbow, fingers point­ing down, the dancers imitates :the fish that the fisherman have just caught. 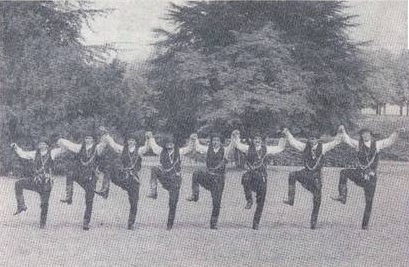 When a dance group from Artvin, during a festival of the Balkan countries in Istanbul, before Ataturk , demonstrates this dance in 1937. Ataturk became so enthesuastic that he got up and did the dance with the group. And ever since then the dance, which was originally called Artvin Bari has been called Atabari. The types of musical instruments used for Artvin dances are mostly the accordion, tulum (the bagpipe), and the drums. In Trabzon region, the instruments used for Horon dance are zurna, drum and kemence. Zurna : This indispensable accompaniment of the davul ( big, double-headed drum) traces back to the early days of Turks in Central Asia. Kemence : This is the instrument of the Black Sea region and is used in no other region. 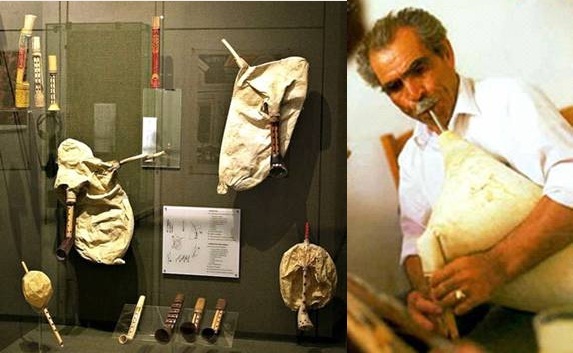 The origins of both the kemence and the kabak kemane is the old, central Asian Turkish instrument, the iklig. Iklig was brought out of central Asia by Gokturks and was further expanded into the Azerbaijan and Anatolian areas by the Seljuk Turks. Kemence has only three strings, and its bow is the horse hair. The horse hair is normally very loose, but is tightened by the player during playing, often tigh­tened and released, allowing loudness or softness of the sound. Horon dances of Black Sea are often performed to cura zurna. However espe­cially indoors, kemaenche is a must. Total length of this instrument is about 20 inches. Erzurum, Kars, Ağrı, Artvin, Gümüşhane, Bayburt, Erzincan provinces. Parts of Kars, Gole, Ani, Igdir provinces. Azerbaijani music is characterized by liberal melodic embellishment and improvisational passages. Both indigenous folk instruments such as the, saz, zurna and Western instruments such as the accordion and clarinet are used. Ercument Kilic was born in Ankara, Turkey in 1958. He began his dance and music career at an age of four and was eventually admitted, as culture specialist/ artist, to the Turkish National Ensemble with which he remained until coming to the U.S. in 1977. 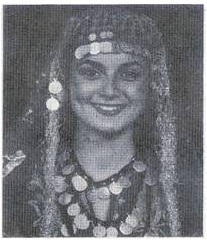 Since that time, Ercument has given lectures on Turkish Culture for dance companies and universities in various countries as he traveled extensively numerous times to Canada, Great Britain, West Germany, Netherlands, Turkey, Switzerland, Republic of China, Hong Kong, Singapore, Japan as well as all 50 states in the U.S.